Paint an image according to the pattern you see, with the signature: Jesus, I trust in You. I promise that the soul that will venerate this image will not perish. I also promise victory over [its] enemies already here on earth, especially at the hour of death. I Myself will defend it as My own glory (Diary, 47, 48). I am offering people a vessel with which they are to keep coming for graces to the fountain of mercy. That vessel is this image with the signature: Jesus, I trust in You (327). I desire that this image be venerated, first in your chapel, and [then] throughout the world (47). These words indicate that the Image represents the graces of Divine Mercy poured out upon the world, especially through Baptism and the Eucharist. Many different versions of this image have been painted, but our Lord made it clear that the painting itself is not what is important. 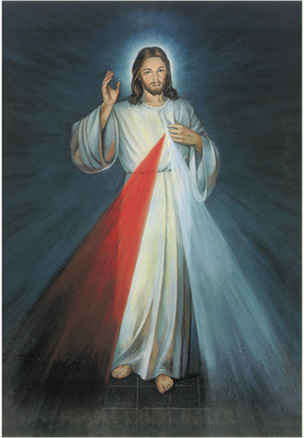 When St. Faustina first saw the original image that was being painted under her direction, she wept in disappointment and complained to Jesus: “Who will paint You as beautiful as You are?” (313). In answer, she heard these words: “Not in the beauty of the color, nor of the brush lies the greatness of this image, but in My grace” (313).